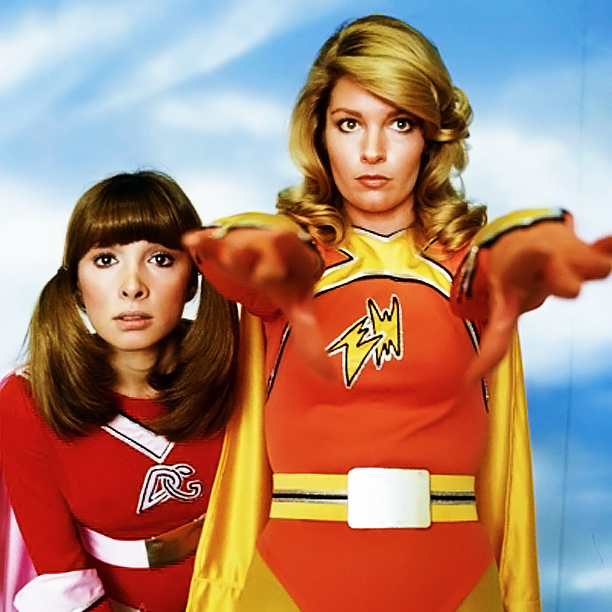 I remember watching Electra-Woman and Dyna-Girl as a kid. Even then I thought it was kind of hokey, but I loved the characters. And now for something completely different… I think you should do a podcast on My Little Pony. No kidding. The latest iteration in the franchise actually has a lot of nerdly references, at least in the first few seasons. >I remember watching Electra-Woman and Dyna-Girl as a kid. Even then I thought it was kind of hokey, but I loved the characters. Looking at it now, I can see that it had a late Silver Age kind of vibe. For a tv show of the time…. working with Saturday AM budgets and time, it wasn’t so bad. Maybe a little dated (since the superhero comics were well into the grittier Bronze Age by now) but as a kid I didn’t care. I think that’s why they’ve had such a hard tome rebooting it; it’s tough to “modern up” the old school wackiness that was the Silver Age. You’d either have to play it for laughs (which I believe the second reboot sort of did) or go all “Dark Knightey” on it…. which the first reboot sort of did. Neither captures the feel, which was as much a product of the time as of the show itself. A lot of old stuff has that problem. >I think you should do a podcast on My Little Pony. No kidding. The latest iteration in the franchise actually has a lot of nerdly references, at least in the first few seasons. Y’know…. it’s not a bad idea, especially considering how much of a cultural event it’s become. It’s a tough topic to find an “in” for, considering how weirdly diverse the fan bade is, and how those elements are received with such varying amounts of acceptance and derision by the general public. Making it…. again, weirdly so…. one of the most potentially politically volatile topics. No, God no. No My Little Pony… Please.. for the love of Mike. Thanks btw for the almost regular shout outs now. They make me smile and laugh, and talk back to my podcatcher in ways that might make my doctor concerned. 1. What about Captain Power? While ostensibly a sci fi show. It’s about as sci fi as Power Rangers. 2. I think the Hulk live action show was really a drama. I think it’s not a superhero show honestly. The entire writing staff were women, and if you go back and look at it, he’s not actively involved in heroics. He’s just trying to be left alone to find a cure. 3. However the made for TV movies with Thor and Daredevil and the Hulk would absolutely be examples. 4. You forgot to mention Jaime Summers was in love with Steve Austin and when they brought her back she had amnesia. That’s how they dealt with her past with him. Erased it! 5. No love for Stingray? 8. HERCULES! WHAT THE HECK ABOUT HERCULES! HERO OF SONG AND STORY. HERCULES… well you get the ticket. 10. Do you remember a made-for-tv movie meant to be a pilot for a character like DarkMan. He was a judge and hid in the shadows? 11. I would say you shouldn’t include shows like Airwolf and Blue Thunder and the like. I think a superhero series has to be all about the main character and the supports have to be pretty strictly supports not to mention you have to have some kind of mission and gadgets or power. I think the A-Team would be called a Superhero show if its just about mildly high-tech gadgetry. Or Max Headroom if its about the gadgets themselves. 12. What was the Canadian cartoon series almost in the same animation style as Johnny Quest where they were down in the sea? 14. We need a show about the Power Records Kids Superhero stories. 16. Babylon 5 is awesome. Just ask the Story Toolkit if you don’t believe me. 17. /\ Worth repeating. And seventeen is a good number to end lists. >No, God no. No My Little Pony… Please.. for the love of Mike. Haw…. sometimes journalistic integrity forces one into the very depths of darkness…. >Thanks btw for the almost regular shout outs now. >1. What about Captain Power? While ostensibly a sci fi show. It’s about as sci fi as Power Rangers. >2. I think the Hulk live action show was really a drama. It definitely is, but it has superhero origins, and I think a lot of the lack of heroics was more a budget/time thing than a specific thematic choice. >3. However the made for TV movies with Thor and Daredevil and the Hulk would absolutely be examples. Yeah; and I kinda think those were attempts to bring it closer to it’s roots; once it was seen to have some popularity. >5. No love for Stingray? The marionation show? Hmmmm…. we’ll probably cover those separately too. Again’ they’re an interesting bit of tv history, but not something with far reaching effects. >8. HERCULES! WHAT THE HECK ABOUT HERCULES! HERO OF SONG AND STORY. I think you have to be Canadian to get that one. >10. Do you remember a made-for-tv movie meant to be a pilot for a character like DarkMan. He was a judge and hid in the shadows? Oh yeah…. don’t remember the name though. There were quite a few in the later 80’s/early 90’s. >11. I would say you shouldn’t include shows like Airwolf and Blue Thunder and the like. Well…. I think they count, but they veer into their own thing pretty quickly. The big thing that makes them super-heroey is that the vehicles are always one of a kind special devices that can’t be replicated (for some reason) until the evil version gets built. Blue Thunder crosses over into the cop show idea more than super hero ‘cos they kind of tone down the superness of the copter. (It’s essentially a really good, but attainable device) and they stuck to a lot of 80’s cop show-isms. Airwolf is definitely a supervehicle show. >I think the A-Team would be called a Superhero show if its just about mildly high-tech gadgetry. This is tricky…. I think you COULD make the case that the A-Team is a superhero show, given the impossible actions they perform; but I think it’s not ‘cos those actions are presented more as tropes than aspects of the characters themselves. So…. it’s not that they’re mechanical geniuses who can build a tank out of common household items; it’s that there’s ALWAYS a fully stocked toolshed that happens the have a bulldozer that the bad guys lock them in. >Or Max Headroom if its about the gadgets themselves. >12. What was the Canadian cartoon series almost in the same animation style as Johnny Quest where they were down in the sea? Hmmmm…. another borderline one. It comes from the old school pulp adventurer realm; which…. like the supervehicle shows is kind of it’s own thing, but definitely from the superhero school of thinking. >14. We need a show about the Power Records Kids Superhero stories. >16. Babylon 5 is awesome. Just ask the Story Toolkit if you don’t believe me.